Hikayat Seri Rama is the Malay literary adaptation of the Hindu Ramayana epic in the form of a hikayat. The main story remains the same as the original Sanskrit version but some aspects of it were slightly modified to a local context such as the spelling and pronunciation of names. Numerous branch stories had also been developed as accretions to or extensions of this epic with the upgrading of minor characters to major ones, or the invention of totally new characters. For example, Malay writers and storytellers have produced variations in which Laksmana (Lakshman) plays a larger role, sometimes becoming more important than Rama the elder prince much like the Lao Phra Lak Phra Lam. Rama, although righteous and virtuous, was perceived to be weak and his character is often moved to the background while the younger Laksmana is admired for his courage and willingness to react decisively. The Ramayana, holy revered text of Hindus, is a collection of Indian mythological stories concentrating on the work of the gods in the lives of men, and was first written down, as legend states, by the sage Valmiki during the third century BC. Rama actually existed, and there are several holy sites in India that point to the reality of Rama's existence, including his birthplace, his palace, and the route of his journey to Sri Lanka. Nevertheless, the Ramayana came to Southeast Asia by means of Tamils traders and scholars who traded with ancient kingdoms such as Funan, Angkor and Srivijaya with whom the Indians shared close economic and cultural ties. Folk versions of the Ramayana were told through dance dramas and by penglipurlara (professional storytellers). The wayang kulit (shadow theatre) adaptation, called Hikayat Maharaja Wana, was one of the most important shadow-plays. Puppeteers would pick the most exciting episodes for their shows, particularly the scenes relating to the marriage of Seri Rama, the abduction of Siti Dewi (Sita), the final battles in Langkapuri (Lanka), and the heroine's rescue by her husband. Its ideals of righteousness, love, loyalty and selfless devotion ensured that the Ramayana remained popular even after Islam's introduction into Asia. The epic was written in its present form some time between the 13th and 17th centuries under the title Hikayat Seri Rama (Chronicle Of The Great Rama) and is generally regarded as a manifestation of the cultural ideals of the ruling elite. It has survived in several recensions but all share the same plot. They are all believed to derive from the oral tradition of eastern and western India with the addition of motifs from the Javanese Panji romance. The name-forms show a distinct Dravidian influence, indicative of the role played by South Indians in disseminating the epic. Despite the high esteem in which the story of Rama was once held, since the Islamic revival of the 1980s the Hikayat Seri Rama has drastically decreased in popularity. However, students of Malay literary history still consider it an integral part of Malay culture. 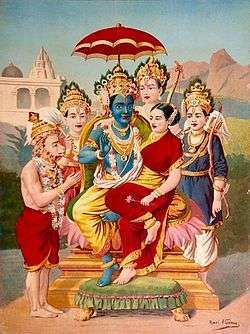 Mandudari (Mandodari)- Ravana's wife. Meghanada's (Indrajit) mother. ↑ Journal of the Straits Branch of the Royal Asiatic Society. 1898. pp. 107–. ↑ Journal of the Straits Branch of the Royal Asiatic Society. 1898. pp. 143–.